Living in the dessert I don't have much of a garden. I keep a few herbs on the back deck protected from the deadly Arizona sun but fresh veggies and fruits are more work than I have time for. The one thing I do have in abundance are a variety of cactus and one day it occurred to me that I do have at least one fruit in my yard that could be used in a cocktail and other goodies. I grabbed my barbecue tongs, gloves and went a-harvesting. Prickly pears protect themselves from the fauna of the desert with long, nasty spikes so you don't want to attempt to pick them with bare hands. If you just use gloves the gloves will get impregnated by the stickers and you'll be stuck sooner or later, so tongs are the perfect answer. You simply grab the fruit completely in the tongs and twist them off the nopales (the "Leaf"). 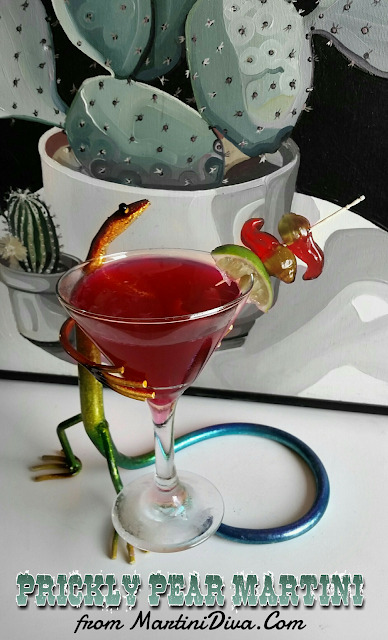 The reddish-purple prickly pear fruit (tuna) is high in antioxidants, Vitamin C and is purported to be prized as a hangover cure. 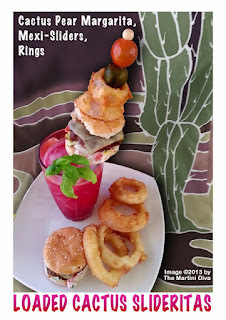 Also known as the Cactus Pear and Indian Fig, the Prickly Pear is a part of the genus Opunti. Here are the steps I took to get my Prickly Pear Juice: First I washed all the pears in a strong stream of water, to clean them and remove as many of the soft glochids* as possible. Put on gardening gloves to do this! Grab the pear by both ends in several layers of paper towels and scrape off the rest of the glochids with a sharp paring knife. Rinse the pear again to wash any of glochids off everything. Slice off both ends, split the fruit down the middle and scrap the fruit out of the skin. Puree all the fruit in a blender or food processor. Strain this into a container through a fine metal strainer to remove seeds and pulp. Have some tweezers and a magnifying glass handy in case you missed any glochids and they found their way onto your poor body. 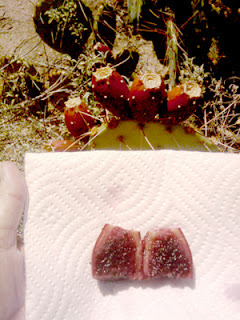 I got one ounce of fresh juice from about eight small, ripe prickly pears. The darker purple the fruit the more ripe it is. Try to get to them before the critters do, we have wild javelina out here and they love prickly pear fruit. While it was a fun and educating experience, after the day long, painful process with its disappointing yield, I have come to the conclusion that the javelina can have the prickly pear tunas in my yard. I'm just going to buy ready made cactus products. DIRECTIONS Chill your cocktail glass in the freezer. Fill your cocktail shaker with ice, add the ingredients and shake until well chilled. Strain into your chilled glass, garnish and serve. 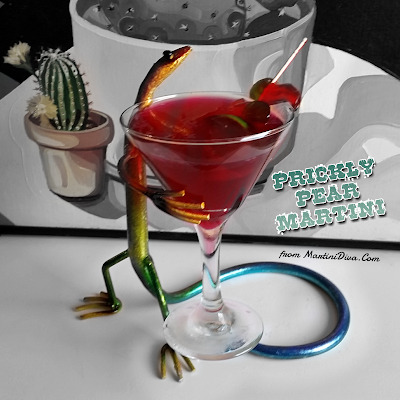 A few days later I also made this fun, loaded Cactus Pear Margarita.